One of the first 4G LTE enabled smartphone for AT&T is rumoured to be the HTC Holiday, an Android 2.3.4 Gingerbread smartphone that up until now we haven’t seen any clear pictures of, but that now changes as several images of the HTC Holiday have now hit the net. 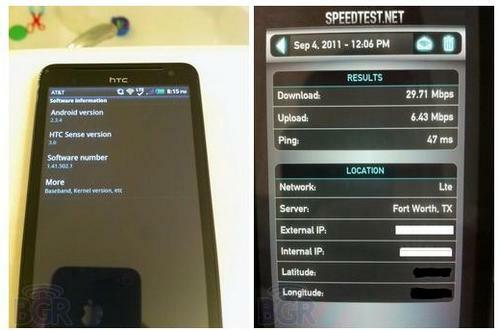 The HTC Holiday photos were obtained by the guys over at the Boy Genius Report and show the Android smartphone along with HTC Holiday LTE speed test images that were apparently snapped in the Dallas/Fort Worth area Texas. Spec wise the rumour is the HTC Holiday should sport a 4.5-inch qHD touch screen, 8 megapixel rear facing camera, 1.3 megapixel front facing camera, 1.2 GHz dual core processor, 1GB memory, and HTC Sense 3.0 user interface, although the specs are currently unconfirmed. As for when the HTC Holiday is likely to come out and play on the AT&T LTE network word has it the Android smartphone will launch sometime in net next few months. Still although nothing has been officially confirmed, it is nice to at last get to see just what the HTC Holiday actually looks like, so are any of our readers pondering whether to pick up the Holiday once it becomes available, or will you wait until move is known on what the Holiday will offer? Feel free to let us know your thoughts by posting to our comments area below.